BUT THERE IS ONLY ONE WAY TO DO IT! WOOL, WATER, PRESSURE, FRICTION AND HEAT. IS NEARLY IMPOSSIBLE TO PULL APART THE FELTED MATTS. YOU JUST HAVE TO CUT THEM OFF. HE TREKKED OFF ON A HOLY MISSION. AROUND A LOT LONGER THAN THAT DEAR OLD SAINT. MAYBE AS LONG AS ABOUT 30,000 YEARS OR MORE! Saint Clement I, was the 3rd Bishop of Rome about 100 A.D.
and is celebrated on November 23. The Persian people's philosophy was that King Solomon's son was tired of weaving waterproof matts and wanted to make them without using a loom. Well, he tried and tried and tried and nothing would work. Night after night he tried. One oppressively hot, humid and desperate evening, on the verge of a nervous breakdown, the son became so frustrated and flustered and angered that he threw a temper tantrum, jumping up and down and crying huge crocodile tears. Finally, after he exhausted himself he threw himself down into the pile of fiber and found that he had felted it to perfection. Thus, he was the discoverer of felting. humid day of hard riding turn the skins into some great felt. A group of Mongolian nomads work together to make felt the traditional way. Copyright � 2006 YouTube, Inc.
HAVE TO HAVE SOME TO TRY WRAPPED AROUND HIS FEET! GOOD ONE, BUT THERE ARE MANY OF MY FRIENDS WHO ARE..
AND.... THEY ALL FELT DIFFERENTLY FROM ONE ANOTHER. THE COMMON THREAD IS HOT WATER, A SOFT DETERGENT AND RUBBING. THE MOISTURE AND HEAT, THE WOOL'S STRUCTURE CAN BE RE-SHAPED. THE HEAT DRIES THE WOOL AND NEW HYDROGEN BONDS ARE FORMED ON THE WOOL STRUCTURE AS THE WATER ESCAPES. THE NEW HYDROGEN BONDS MAINTAIN THE WOOL IN THE NEW SHAPE. HIGH HUMIDITY CAN CAUSE THESE HYDROGEN BONDS TO BE BROKEN AGAIN. WHICH IS CAN BE FOUND ON MY LINKS PAGE. YOU WILL FIND SEVERAL OF THE METHODS USED FOR FELTING THERE. The longer the felt is fulled the finer it will be. it can be cut and blocked into any shape. Wool felt has high thermal insulating properties. It absorbs shock and sounds. untreated fabrics and it can be dry cleaned. The properties of felt effects its application. suitable for blocking into hats. ear muffs, pennants and table padding. skirts, boots, scarves and many other wearables. lends itself to various industrial uses. 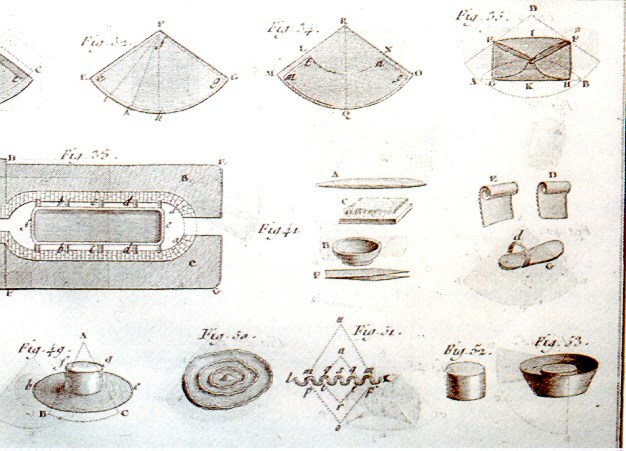 The purpose of fulling was to scour and cleanse the cloth, to eliminate all the grease and dirt and then to felt the cloth, by forcing the fine, scaly, and curly fibers to interlace and matt together to give the cloth a necessary cohesion, strength and to shrink and compress the cloth, giving it greater density and weight per square foot, fulling could shrink the cloth up to 50% or even more. The photo above is of an ancient medieval wool press. Probably part of the FULACHTA FIADH. There is a link to a great website on this subject on the link page. FROM THE ANIMAL TO THE END PRODUCT OF A HAT. Actually called "Encyclopedia Methodique( 1787) from several centuries ago. In it are very detailed accounts of the felting process. 2. Pullers" Removed the coarse guard hair while holding the pelt on his knee. He used a large knife or tweezer and plucked out stiff hair. 3. "Fluff" a prepared fiber pile often called "fluff" arranged, beaten, and matted to an 4 ft. long oval shape. The fluff then goes through a "basoning", heated and steamed and formed into a cone shape. 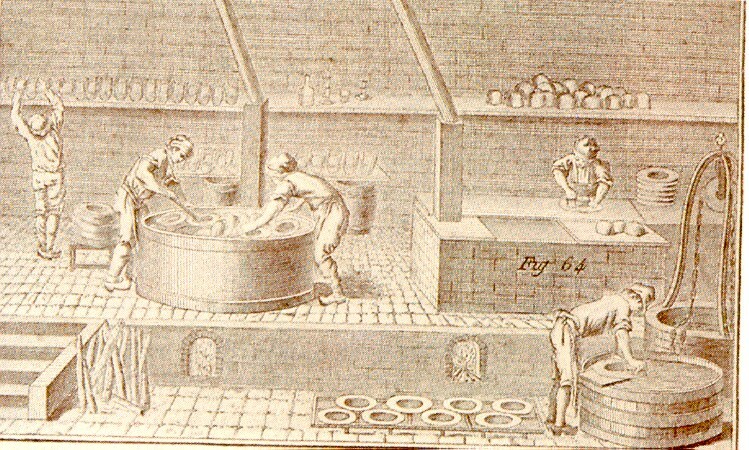 During this process, Carrotting was done using a solution of nitrate of mercury (caused Mad Hatter's disease). 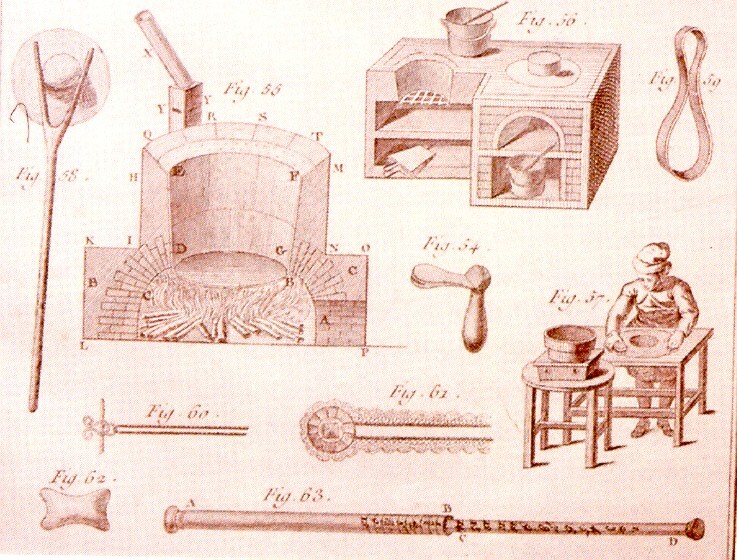 This solution caused the scales on each fiber to pull away from the hair shaft which enabled the felt to be better felted. 4. Shaping the fiber, starting to felt. During"Planking", the cone shape is dipped into a solution to toughen and shrink the cone, which is now smaller, sturdier and stronger. 8. Blocked Crown. The hat is dried and stiffened over a hat shape or hat block. It can be shaved, sanded, lacquered or waterproofed. Now, the hat can be embellished with a band, feathers, leather strips and is usually edged with a soft fabric. 10. Finished product. A perfect hat. find on everything he could possibly think of. are still considered to be excellent! 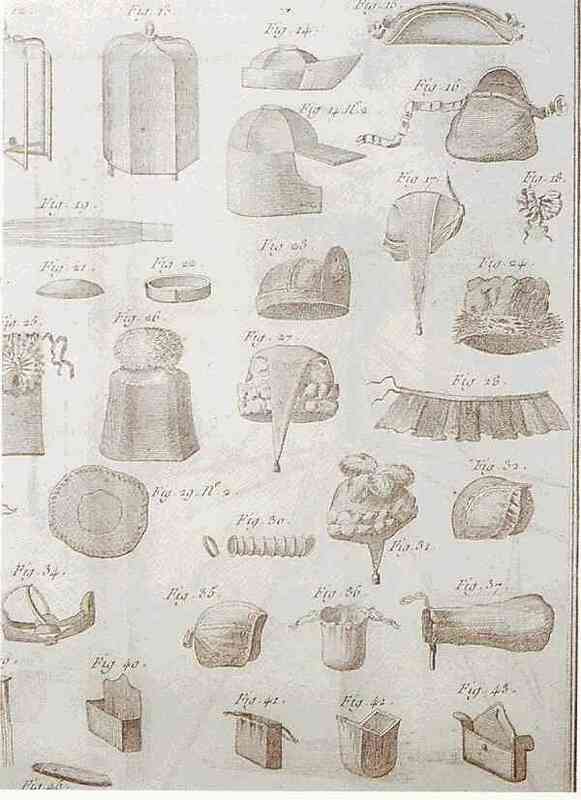 This illustration shows the making of felt hats. and work them into form. The bow actually looks like a violinist bow. The bow hung from the ceiling directly over the fiber. The bow was actually "twanged" repeatedly over the fibers. fibers and pushed it through slats letting it fall onto the floor. necessary aligning of the fibers. 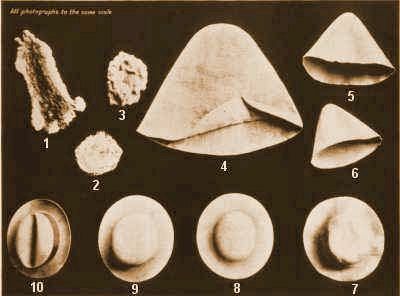 and imagine the processes used to felt hats. 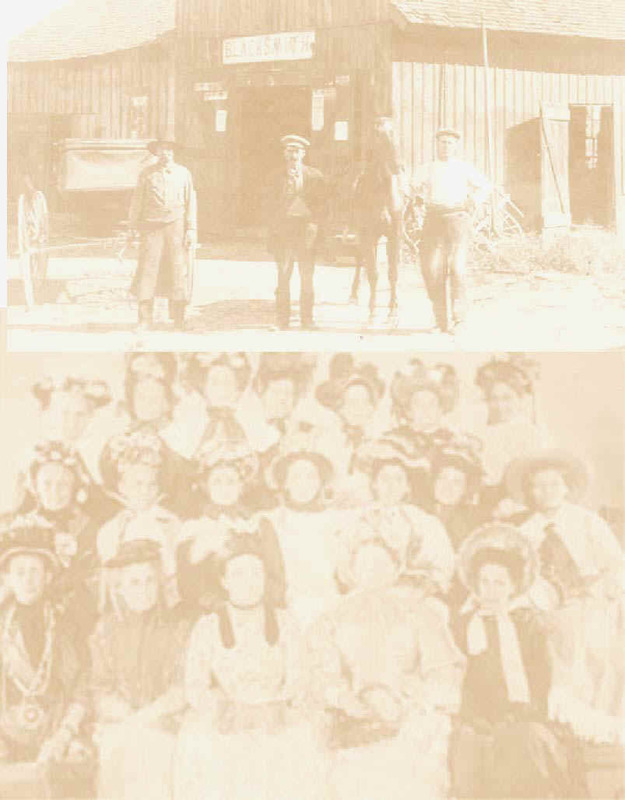 figure 14 in the above photo shows the giant bow. shrunk using heat, water and manipulation. The plank or trough has changed little over the years. For centuries these troughs were used in the felting process. along with other ingredients to affect the fiber. 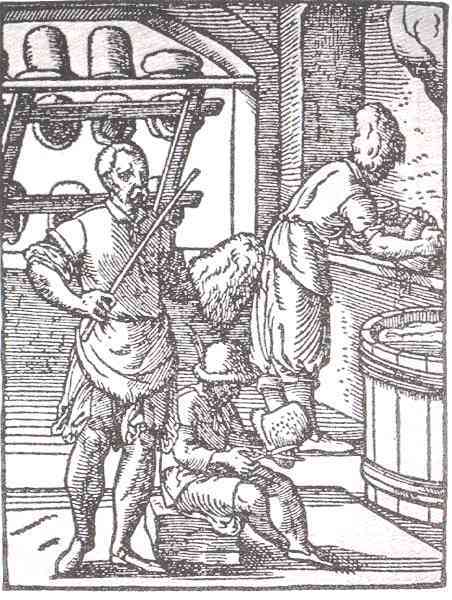 A cap maker's workshop from Jost Amman's Book of Trades, 1569. On the right, the caps are felted and shaped over a barrel of heated water. In the middle, the other worker beats them to soften them and to detach the loose hairs, and another shears them. Those completed are ranged on the shelves at the back and appear to have a textured surface. The planking room in which the felt is worked until it is the right size, consistency and shape. 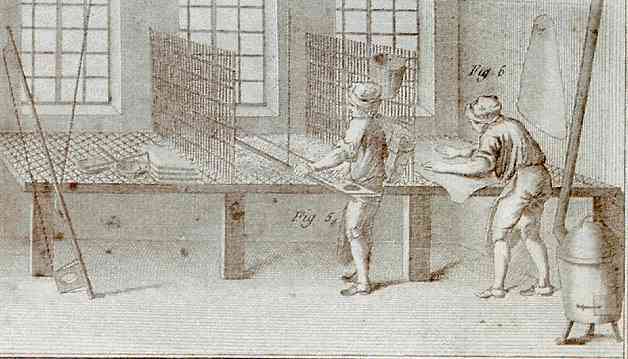 The planks on which the men work have changed little since the 18th century. This is soft felt finishing room. 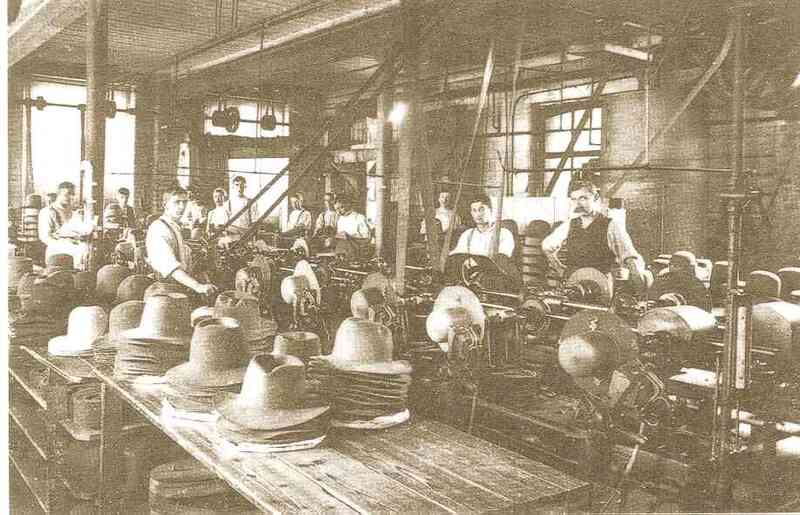 Here the hats receive their final block and check. 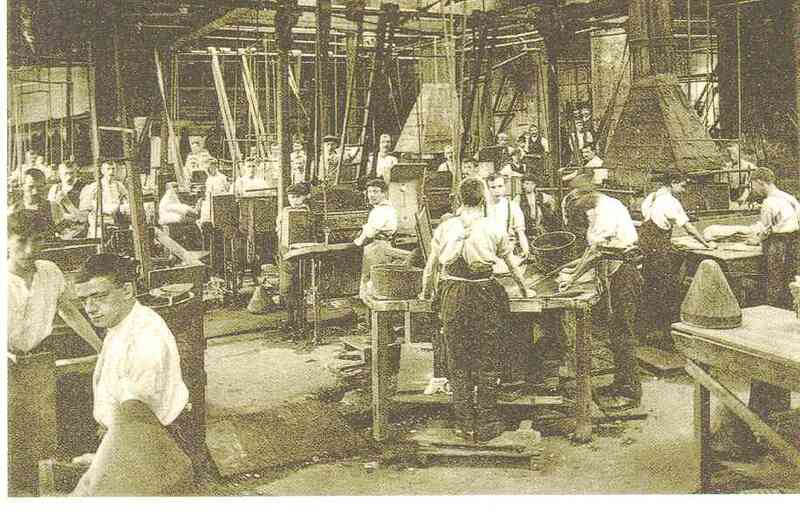 The blocks were rotated and heated by machinery. seen on the bench in the foreground. 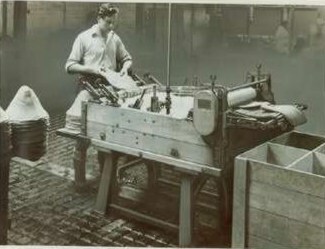 The photo above shows a man using a felting machine. 1800's manufacturer and builders book.